Recent devices offer to vapers different settings and capabilities like a control of temperature or a fine tune of output voltage or wattage. 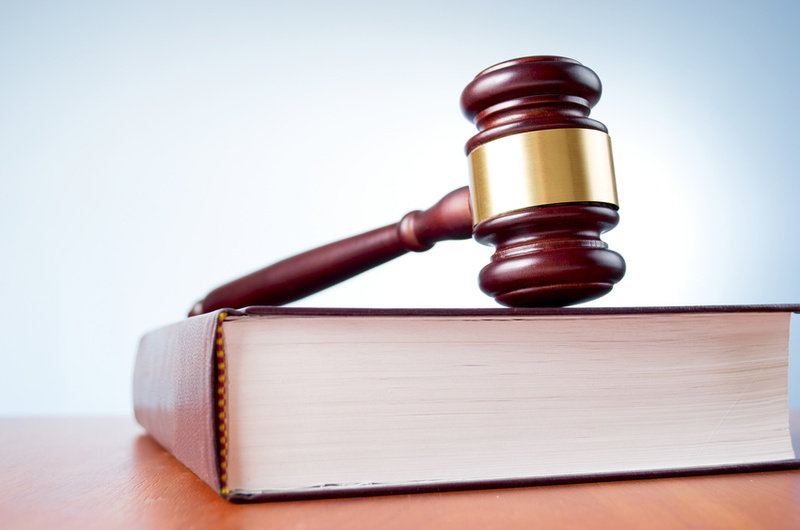 However, increasing the power of mods or exploiting their power vaping capabilities is not without risk. 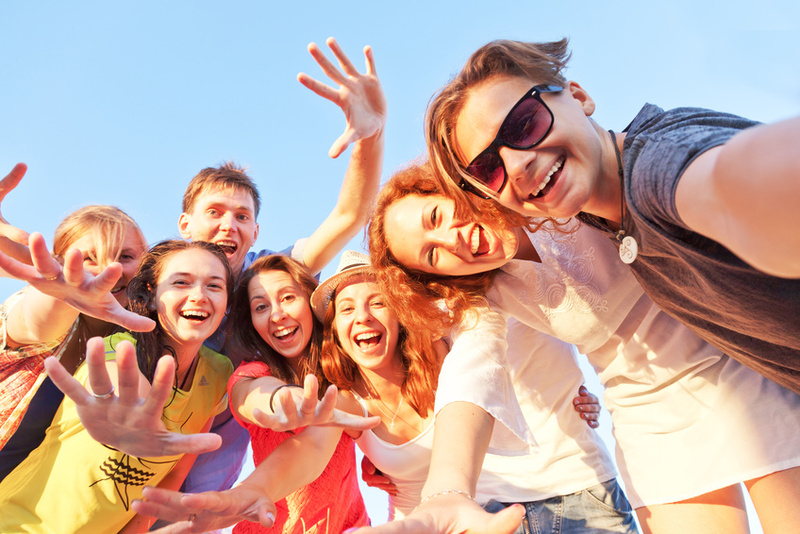 Good practices are required and may contribute to a safer vaping style. Some studies show that vaping is not absolutely safe and the risks are linked to the toxicity of emissions. Among toxic products are aldehydes, like acrolein, formaldehyde, benzaldehyde, propionaldehyde or acetaldehyde, and more recently furans, produced from sugars. 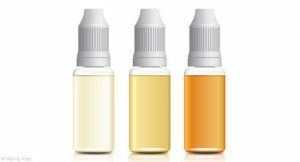 If you are new to this topic, vaping is basically the action of vaporizing a liquid called e-liquid or “juice”, that contains or not nicotine, propylene glycol (PG), vegetal glycerine (VG) and flavorings. In the process, a cotton wick is soaked with the e-liquid and heated with a resistive wire, the coil, traversed by a current supplied by a battery. In this article, we will investigate the mechanisms that contribute to toxicity in the emitted vapor in order to limit vaper’s exposure, we will also see what issues are associated with coils gunk, how it is formed and how to efficiently clean up the atomizer to keep the risk of inhaling toxic chemicals as low as possible. Important noticeIn a context of harm reduction, vaping is considered by an increasing number of health professionals as a healthier alternative to smoking and can be considered a healthier compromise for smokers before they stop smoking altogether. Public Health England reports a heath benefit of 95% when switching from smoking to vaping, an estimate that has been backed by the UK’s Royal College of Physicians. Chemical analyses of emissions comparing combusted tobacco and electronic cigarettes show that smoking is generally a much higher source of aldehydes than vaping. But under certain circumstances, vaping may produce comparable levels of aldehydes and it is important for a vaper to learn how to limit self-exposure. A specific circumstance under which aldehyde concentrations may raise to dangerous levels is a dry puff. But fortunately, a dry puff is rapidly identified by the vaper who will avoid inhaling the vapor because of the presence of acrolein, a compound with a disagreeable acrid smell. The danger of aldehydes comes from their effects on metabolism. Aldehydes are not only irritants for the aerial tract, they also have adverse human health effects, leading to the formation of tumors in the most acute conditions of exposure. Such conditions are met, for example, at the level of the nasal or buccal cavity of a smoker, where the smoke is first in contact. In a recent article, we warned about the role of furans, originating from sweet additives, and confirmed that their toxicity for humans had not been demonstrated. In turn, experiments carried out on animal models, especially rodents, point out their potential toxicity and carcinogenicity. As discussed about furans, the user is playing a really important role in setting the level of the risk he exposes him/herself. Lowering the risk of inhaling harmful or potentially harmful (HPH) compounds is possible and we will try to pick up indications from the scientific literature to guide you to achieve this goal. It is important, at this point, to recall that aldehydes and furans are only few of the thousands of chemicals a smoker inhales. When addressing the aldehydes and furans concerns with regard to e-cigarette use, one should keep in mind that this issue has never raised questions before, although science revealed their presence in combustible cigarette smoke several dozen of years ago. 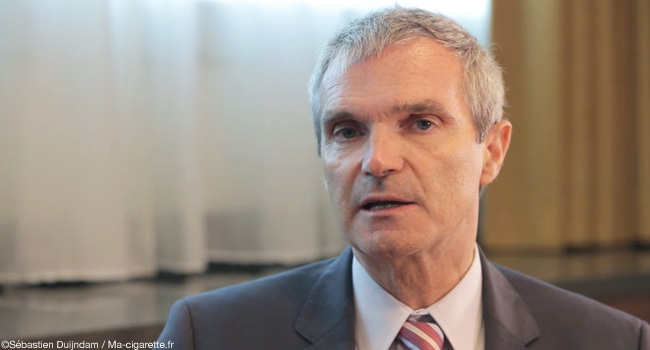 The findings that Konstantinos Farsalinos recently described at the 2016 Vapexpo event in Paris raised awareness on a new vaping pattern, Direct-Lung (DL) inhalation. This vaping style appeared in the last years with the popularity of subohm atomizers designed to produce big clouds. 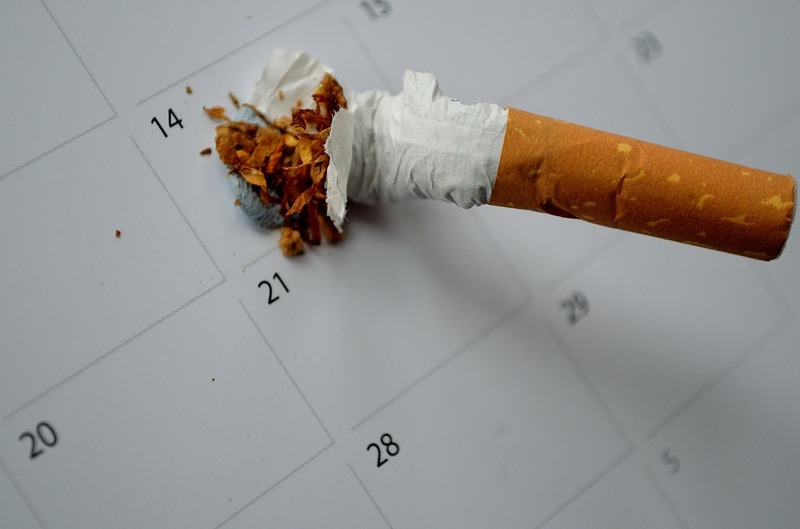 Direct-Lung inhalation breaks with the way smokers usually puff on their cigarette, where the smoke first goes in the throat and then goes down to the lungs. As opposed to DL inhalation, Mouth-to-Lung (MTL) vaping is closer to the action of smoking and the first vaping pattern a smoker adopts when switching to vaping. 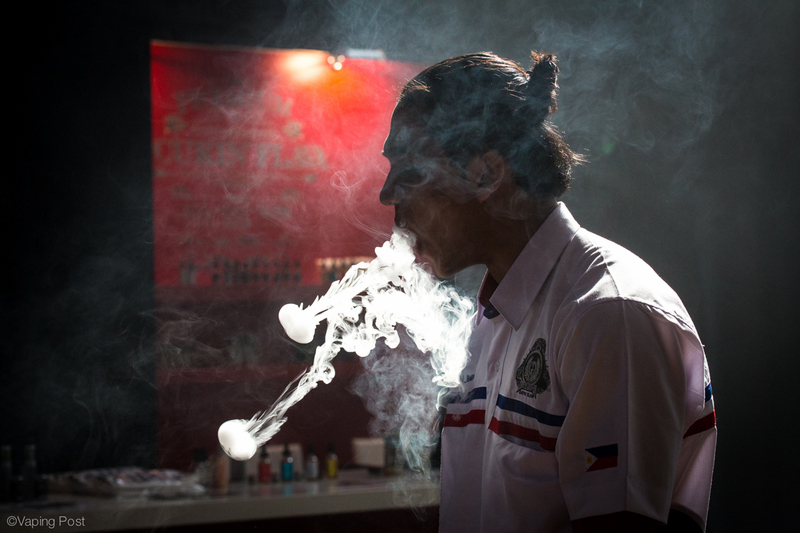 DL inhalation could be compared to inhalation patterns of shisha smokers (also called Hookah). The Greek cardiologist expressed concerned on exposure to aldehydes because higher temperature is required to produce the large volume of vapor this new vaping style requires. Both high temperature and higher consumption of liquid concur to increase vaper’s exposure to HPH chemicals, among which are the aldehydes. 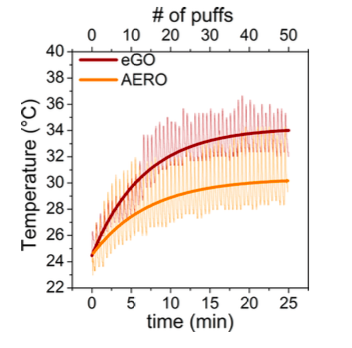 Researchers from Berkeley recently investigated in their laboratory the emissions of some e-cigarettes and provide scientific-based evidence that temperature is an important parameter in the production of aldehydes and HPH chemicals from regular e-liquids. They also confirm that the composition of the aerosol generated with an e-cigarette can be substantially different from the composition of the original e-liquid. 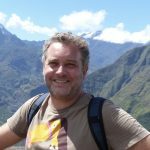 In their publication , Hugo Destaillats and his co-authors found that concentrations of aldehydes were more important at higher e-vapor temperature than under initial cooler conditions. 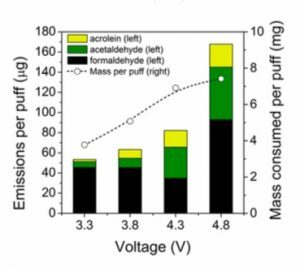 Emission rates of aldehydes (acrolein, acetaldehyde and formaldehyde) were also higher for a single coil than for a dual coil atomizer, likely due to higher temperature produced with single coil devices for the same voltage. The authors pose that Acrolein was primarily produced by thermal dehydration of VG while thermal dehydration of PG lead to the formation of Formaldehyde and Acetaldehyde. Up to 31 compounds, including nicotine, nicotyrine, formaldehyde, acetaldehyde, glycidol, acrolein, acetol, and diacetyl were identified by this study. They also identified for the first time the intermediate products: Propylene oxide, acetol and methyl glyoxal. They believe that propylene oxide was an impurity originating from the synthesis of PG and thus, suspect that it may be present in most e-liquids on the market. Acetol also is a by-product of the conversion of VG to PG and may be found in the aerosol. 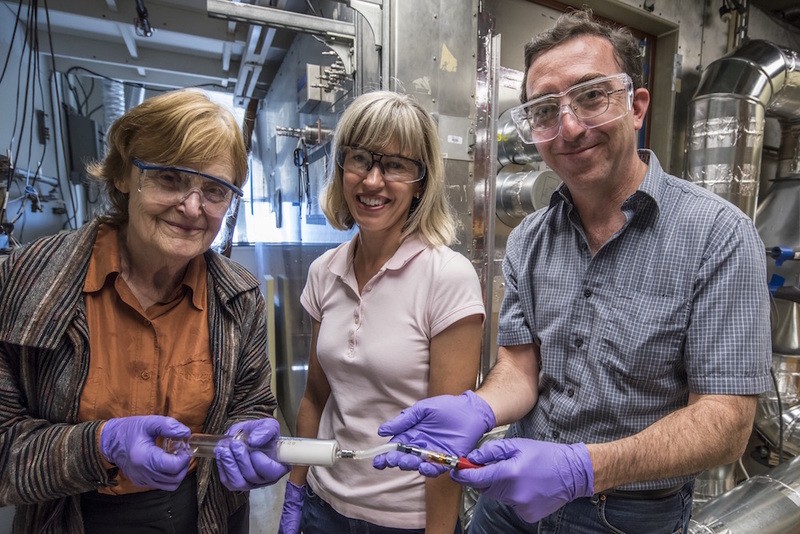 The Berkeley researchers demonstrate that the temperature reached with a single coil atomizer is consistently higher than with a dual coil. They noticed when playing with voltage that some compounds like methyl glyoxal appeared at higher voltage but were undetectable at the lower ones. This indicates that the higher temperature reached at higher voltage, in application of the Joule effect, is more likely to degrade e-liquid solvent (PG/VG) and to produce a wider array of HPHCs. It explains why the compounds produced by a single-coil atomizer were different from and maybe more potentially harmful than that produced by a dual-coil system for the same voltage. The authors show that increasing the voltage of the single-coil CE4 atomizer (2.6 Ω), what they call eGO even if that name describes more a type of battery, resulted in a greater emission of aldehydes than a dual-coil Aerotank Mini atomizer (2.0 Ω) with a VisionSpinner II battery allowing for variable voltage from 3.3 V to 4.8 V. An increased consumption is also observed that they determine twice as important at 3.3 V than at 4.8 V (2.6 Ω). 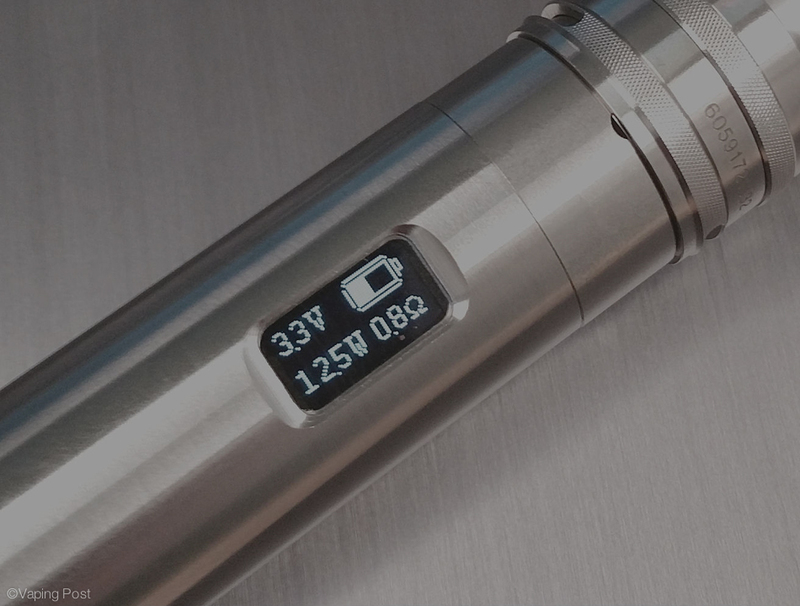 Based on their observations, the authors believe that “most of the additional energy provided by increasing the voltage in the range of 3.3−4.3 V was used primarily to evaporate larger amounts of e-liquid“. The upper range,4.3 V- 4.8 V, is rarely selected by vapers using a CE4, but at such high voltage occurs “a marginally higher amount of evaporation combined with greatly enhanced decomposition of the main e-liquid constituents“, in other words, more aldehydes are generated. Clearly, data available on ageing coils are not sufficient to conclude, more research is needed in this field to see how ageing affects emissions. In a separate experiment, Sleiman et al. used the single-coil atomizer repeatedly at 4.8 V over consecutive puff cycles. Again, this situation does not represent a reality but is used to simulate ageing of the device without cleaning the coil. 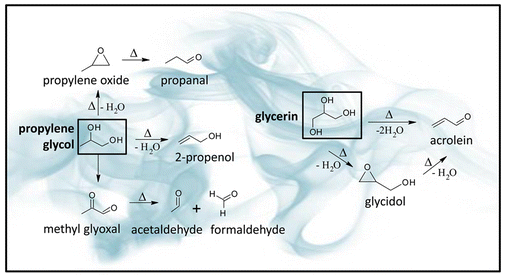 The results show about 60% higher production of aldehydes with greater contributions of formaldehyde, acetaldehyde, and acrolein in the absence of cleaning, “likely due to the buildup of polymerization byproducts that degraded upon heating“, notice the authors. The underlying mechanism proposed by the authors is the accumulation of residues on or near the coil, when heated, constitutes a secondary source of VOCs (aldehydes and probably furans, even if not spotted by the researchers). The authors’ conclusions reflect an absolute risk in the specific case of their experimental design, and should not hide the relative benefit of vaping for smokers. The researchers remain in a sort of “comfort zone” by not addressing the relative risk of vaping compared to smoking. Although aldehydes can be a major concern when optimising vaping products safety, one has to remember the thousands of HPH chemicals contained in tobacco smoke. Even in the worst conditions of use, the e-cigarettes tested in Berkeley Lab emitted less acrolein than regular cigarettes. 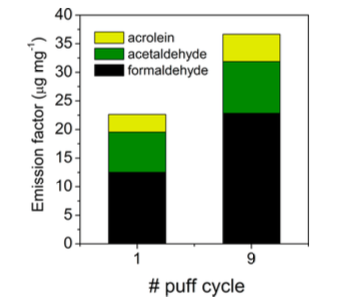 Acrolein concentration in vapor was in the lower range of emission in the mainstream smoke of a combusted cigarette (i.e. 260 μg/cigarette or 17 μg/puff with an average of 15 puffs/cigarette; WHO). What the study does not tell with formaldehyde, for example, is how much of this molecule is produced when vaping compared to what is inhaled when smoking and with regard to natural exposure to this molecule. The relative proportion of aldehydes produced by an e-cigarette and other tobacco products is addressed in a short video. Even if this is not science, the video is a good indication of an attenuated risk compared to smoking. How serious that study is? Some comments on the internet judge the study “controversial“, consider the use of a CE4 atomizer and an eGo device outdated and even consider that 4 V is the upper voltage for such device. Some comments are also critical with science that does not follow the evolution of the market or that tests e-cigarettes under unrealistic conditions. Why unrealistic? Because it is obvious that using a CE4 beyond 4 V is not common, and because with such levels of acrolein, a vaper would probably have avoided to inhale the vapor due to the very unpleasant taste of this compound. The team couldn’t ascertain that dry puffs did not occur in the experiment, especially at high power since samples were taken with a syringe and not double check by a vaper. The authors declared that further study would be carried out involving a testing panel to circumvent the critics that may be made on the use of vaping machines to reproduce behavioral patterns. Although devices used in this laboratory study are outdated, they satisfy the purpose of the experiment since what was expected was a variable voltage and a resistive wire to vaporize e-liquids. In our opinion, such study, instead of demonizing vaping, can rather be seen as an help for vapers and manufacturers to choose or to design safer devices. Reinforcing their benefits rather than “[…] limiting the harm caused by e-cigarettes” – Even if the wording employed by the researchers could take its origin in regulators registry, the informations provided are useful and reproducible. The authors note that using devices at lower power may reduce the exposure to HPH chemicals and especially to aldehydes. On various forums, users evoke the role of additives like sweeteners and other exhausters in the production of gunk on coils rather than temperature. They often link the color and the taste of their juice with its ability to form a residue on the coil: the darkest or the sweetest, the fastest. It is clear that adding particular ingredients to give a sweeter taste has become more and more common, which makes the amount of flavorings in e-liquids much greater in response to a growing demand for sweetness. 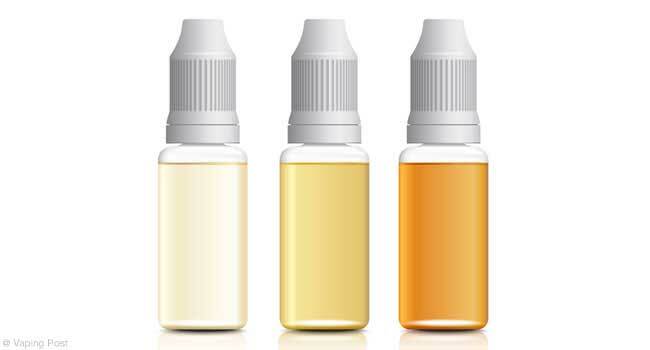 In e-liquid blends, flavorings often exceed 15% in volume and can even reach 20-22%. As we will see later, a darker juice is an indication that the reaction favorizing gunk formation, the Maillard reaction, has already progressed. None of these has been scientifically demonstrated in our domain but in terms of ingredients and temperature, science of cooking may provide interesting answers to certain questions. Interviewed by the Vaping Post about gunk formation, Riccardo Polosa who chairs a workgroup on standards for e-cigarette emissions of the European Committee for Standardization (CEN), explains that many sources could be involved to produce gunk on the coil surface. Everything indicates that thermal dehydration and the Maillard reaction are playing a leading role in the formation of gunk. The former is a synonym of drying, the latter corresponds to the recombination of sugars and amino-acids present in e-liquids and an additional source of aldehydes that remains to be explored. This non-enzymatic reaction typically starts from around 140°C to 165°C (285°F to 330°F), and forms brown residues above 170°C (340°F). Some vapers may say that all these gunk are due to too many chemicals and suggest returning to natural and organic flavorings. An important point is made by Riccardo Polosa for vapers who could be inclined to believe that using natural or organic flavorings could prevent such phenomenon from happening. Some e-liquid manufacturers are currently studying e-liquids with a better tolerance to thermo-degradation and a better rendering of flavors at lower temperatures. Efforts are also made to provide liquid carriers (PG and VG) with a higher grade so that the presence of impurities is reduced. Finally, as defended by K. Farsalinos, some of the flavorings can be selected with molecules of a much lower risk profile (for example Diacetyl or benzaldehyde) without altering the taste. Even for the sweet, some sugar alcohols like sorbitol, maltitol and xylitol do not participate in the Maillard reaction and likely have a lower risk profile compared to fructose and saccharose. As coil gunk appears to be an extra source of aldehydes and probably of furans as well, it is important to be very attentive to what happens in the atomizer. How to avoid coil gunk? How to clean up your atomizer? It may however happen that gunk builds up, even when vapers take all the above precautions. 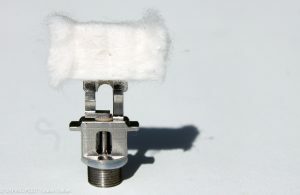 In this case, it is highly recommended to clean up your atomizer when changing the coil. A few drops of liquid soap (the one you use to clean dishes) will help removing greasy residues. A smooth brush (a teeth brush or a bottlebrush) will exert a mechanical action against the crust. Alcohol seems to a better option than acetone to remove greasy remains. Hot water to soak the different parts of the atomizer overnight. Using vinegar would accelerate the oxidation of metallic parts and, depending on its concentration, even “attack” stainless steel, weakening its surface and lead to the release of particles. The goal of soaking in hot/warm water is to re-hydrate the gunk residues to remove them, but the hot water itself is not really efficient on greasy residues. As PG and VG are mainly fat, the best way to smoothly remove such residues is to employ liquid soap combined to a mechanic. Long-term use of a wire resistance causes oxidation at its surface. 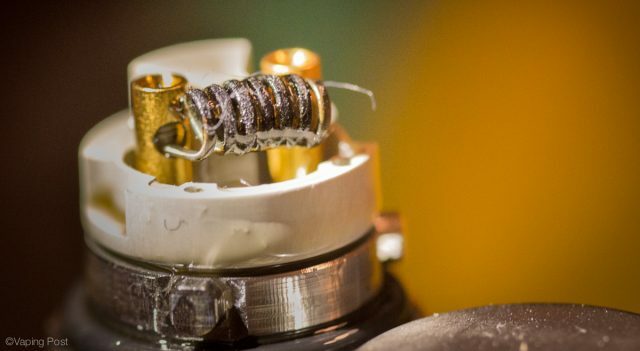 The oxidized metallic scales peel off when the coil is heated in presence of e-liquid and, with time, the resistance wire looses its mass, which affects its physical properties. The longevity of a coil is then limited in time and it needs replacing at one point. How to recognize when to change a coil? If your device is equipped with resistance detection features, a significant change of this value is the first clue to evaluate the life span of a coil. It is the reason why changing a coil must be associated to re-calibration. You may also be tempted to use ceramic coils instead of metallic resistive wires. Their safety is not warranted since different types of ceramic coils are available from different manufacturers. Despite claims for their awesome longevity, the porous ceramic is more fragile and their permanent cotton coating favors gunk buildup so that you will probably have to change a porous ceramic coil at the same frequency as a traditional resistive wire. On the other side of the spectrum, the metallic coils coated with a ceramic glaze and wrapped with a disposable cotton wick are probably of a better quality but they may not comply with the temperature regulation features of your mod. In conclusion, vaping is not safe but is much safer than smoking. Smoking is the major cause of prematured death on Earth and many studies reveal that most vapers are ex-smokers who switched to vaping to cut with a lethal habit. When compared to mainstream smoke, vapor from e-cigarettes contains much less harmful or potentially harmful chemicals, no carbon monoxide and no carbon dioxide resulting from the combustion of tobacco. With special care, it is possible to significantly reduce the exposure to harmful products. A good knowledge of your hardware, of the risk factors, a careful selection of your e-cigarette parts and of the quality your e-liquids will surely increase your pleasure of vaping. Sleiman M.,Logue JM., Montesinos VN., Russell ML., Litter MI., Gundel LA., Destaillats H., 2016. Emissions from electronic cigarettes: Key parameters affecting the release of harmful chemicals. Environ. Sci.Technol., 50, 9644-9651.